I had never been to the Philippines ever, or since. But I was there in the homeland of my parents on one of the most important days in the history of that country–Aug. 31, 1983. As a young American Filipino reporter for the NBC affiliate in San Francisco, I had convinced my bosses that the death of Sen. Benigno Aquino, the main rival of the dictator Ferdinand Marcos, was not some remote international headline. No, this was a big story for the more than 300,000 Filipino Americans living in the Bay Area. With many Filipino immigrants originally from the Ilocos region of Ferdinand Marcos, and the rest of them either in the U.S. because of Marcos martial law as immigrants or exiles, the Philippines story was as local as a five-alarm fire. There was also the special relationship between the U.S. and the Philippines, the former colony made up to be a replica democracy in brownface. Never mind the dictatorship part. The Reagan and Bush administrations had given its blessing to the Marcos regime. Remember Vice President Bush’s infamous praise for Marcos and his “adherence to democratic principles”? You mean, like human rights violations and torture? Yes, and ultimately, the assassination of one Sen. Aquino, who was killed upon his return from exile in the U.S. to Manila on Aug. 21. I had arrived in the country in time to make it to the Santo Domingo Church in Quezon City, to see Aquino’s widow Cory give the eulogy, and then to see the massive funeral procession–1 million strong throughout the streets of Manila. In part, it was an adoration of Benigno Aquino, the chosen anti-Marcos, the man Filipinos had hoped would lead them to freedom. But it was also the first healthy public condemnation of Marcos, the man who had sucked the life, liberty, and riches from the country under his repressive martial law regime. Within three years, in 1986, the country’s resentment of martial law would reach amok levels, and with the help of the military, Marcos ultimately would be forced to flee the country. And it was the funeral procession on Aug. 31, 1983, that let everyone know it was all coming soon. So imagine the irony of today, Aug. 31, 2016. On this day, the Philippine Supreme Court officially began hearing oral arguments for and against a plan to give Marcos a hero’s burial in the Philippines’ national cemetery, the Libingan ng mga Bayani. The proposal made by the newly-elected Philippine President Rodrigo Duterte, the authoritarian tough guy who has been likened to Donald Trump, has split the country and Filipino diaspora community around the world (which incidentally exists mostly because of Marcos). You either see Marcos as a former president who deserves to be taken out of cold storage and buried on hallowed Philippine soil. Or you simply can’t forget the long list of human rights abuses of political opponents, Benigno Aquino chief among them. The disappearances and executions of thousands of political foes. The estimated $10 billion stolen from the country for his family’s personal gain. U.S. federal court judgments in 1994 and 1995 awarded martial law victims nearly $2 billion, of which payments were first made in 2011. A wall-like monument like the Vietnam Memorial has been erected near the University of the Philippines-Diliman campus is a constant reminder of the names of those victimized by Marcos’ 20 years of martial law. And yet 33 years after the Aquino funeral procession, when the country first expressed mass outrage over Marcos, a new generation of leadership is considering honoring the Filipino tormentor. I talked to one Filipino immigrant, who had come to the U.S. during martial law and was now an American citizen. He was all too willing to forgive and forget. “Well, even the Germans have forgiven Hitler,” he said. Many still see Hitler rightly as evil incarnate. But I don’t want to elevate Marcos to Hitler status. The Philippine dictator’s actions weren’t fueled by the belief of the racial superiority of Filipinos among, say, all of Asia, or above all ethnicities. Marcos simply saw himself as superior to other Filipinos. He subjected his will over lesser Filipinos, which actually made him a whole lot worse than anyone can imagine. He perpetrated the crimes against his own people. His own country. There’s nothing heroic about that. And yet, oligarchs will do as oligarchs will do. Forgive each other and hope that a new generation of ignorant millennials will help them form a new majority of revisionists. They have all been subjected to very little education on the human rights abuses of Marcos. They only see the dictator as the man who ushered in the “Golden Age” of the Philippines. Public education! National highways! Flush toilets! Ah, modernity and selective amnesia. 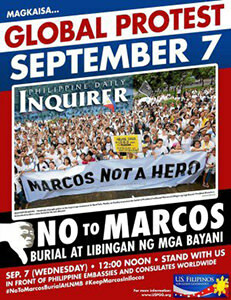 On Sept. 7, Filipinos globally who have memories that won’t quit, as well as a strong sense of history, have planned demonstrations at Philippine embassies around the world to express their anger at the thought of a hero’s burial for Marcos. It should be a loud and vocal outcry. 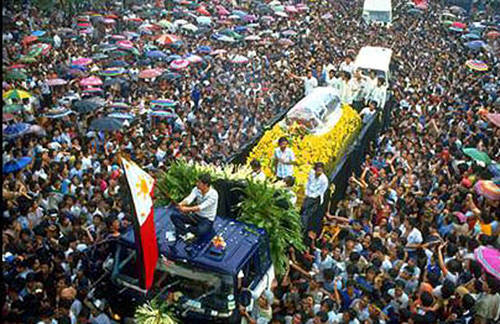 I can’t imagine it collectively being much louder than what I saw Aug. 31, 1983, when a million people thronged the streets to follow the casket of Aquino. But it very well could be–a protest against a hero’s burial for Marcos, the man many feel responsible not just for Aquino’s death, but for the current fate of the Philippines.